The endgame may not seem like the most exciting phase of the game, but in close games your endgame skill will often determine the outcome. A few points here and two points there and a sente or two and you’re back in the game. This version of SmartGo Books adds three more endgame books, for a total of five. The question is not whether you need to improve your endgame — there’s always room for improvement. But which books are right for you? (A) 200 Endgame Problems by Shirae Haruhiko (Slate & Shell): An easy read that will train your eye to see potential endgame gains. The problems often build on each other to provide a great learning experience; pretty much everybody 15 kyu and stronger would benefit from this book. Whether you’re brushing up on your endgame tactics or want to get a feel for endgame tesuji without dry theory, this will help. (B) The Endgame by Tomoko Ogawa and James Davies (Kiseido): A full treatment of the endgame, from counting, sente, gote, endgame tesuji, to the macro-endgame. 106 problems. The best overall introduction to the endgame. 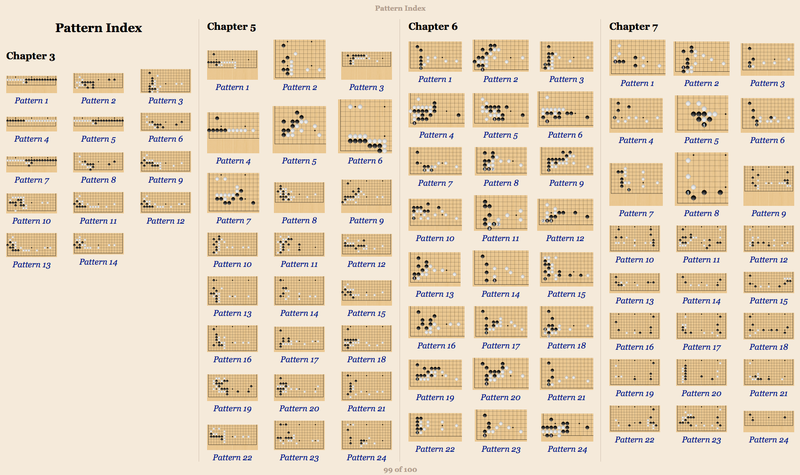 (C) Lee Chango-ho’s Endgame Techniques, Volume 1 by Lee Chang-ho (Yutopian): Starts with elementary counting of endgame moves, then takes a systematic look at many common real-game patterns, including large endgame moves. Really helpful in assessing lots of common situations, as shown in this pattern index. (D) Lee Chango-ho’s Endgame Techniques, Volume 2: The second volume looks at endgame tesuji, with 50 elementary problems, 45 intermediate problems, 36 multiple choice problems, and 36 advanced problems. A great collection of endgame problems by the master of endgame, with dan-level advanced problems. (E) Get Strong at the Endgame by Richard Bozulich (Kiseido): Mostly a problem book, with endgame tesuji as well many great full-board problems on small boards. 291 problems. And a bonus: working on endgame problems will also help your overall reading skills.